Write about transport architecture for any length of time, and you become aware of the long shadow cast by the Euston Arch, which is ironic considering it doesn’t even exist any more. It has become a touchstone for the vandalism done to historic transport architecture. The failed campaign to save it from demolition in the 1960s sparked another campaign which successfully led to the reprieve of nearby St Pancras station a year or two later. Not only a London landmark, the Euston Arch represented an important part in the story of transport, which is perhaps why its loss rankles still. But I think it was only the second-best bit of the old Euston, a ramshackle but extraordinary station which could never realistically have survived, but the loss of which diminishes British railway architecture to this day. 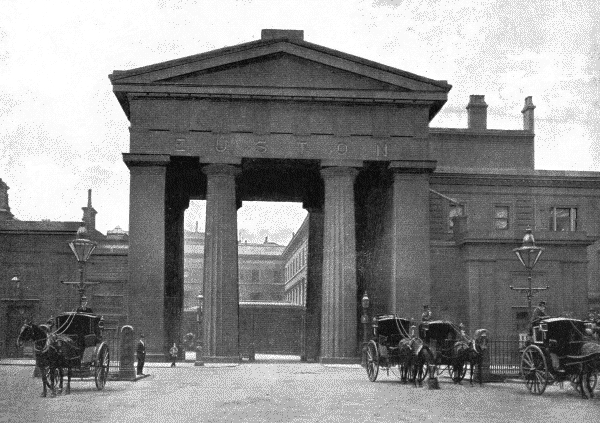 The Euston Arch dated back to the very birth of the railway industry, in the first half of the 19th Century. Euston station was the London end of the London and Birmingham Railway, the world’s first long distance inter-city railway. The company employed the well-respected architect Philip Hardwick, who became the world’s first in-house railway architect. For the termini at each end of the line Hardwick drew on classical Greek architecture, with two landmark buildings built in 1838. For Euston in London he provided an entablatured Doric archway (or, to be strictly accurate a propylaeneum, though it was never called that). For Curzon Street in Birmingham he designed an Ionic portal building (the difference, if you’re curious, is to do with the shape of the columns). At the princely sum of £35,000 (goodness knows how much that is today, but Thomas Cubitt, architect, developer and brother of King’s Cross architect Lewis Cubitt, reckoned you could build an entire mainline terminus for that much¹) the Euston Arch was massively expensive and just as massively constructed, standing an impressive 22m tall. Despite the controversy over its demolition, it was in fact never universally popular. Many contemporaries thought a grand arch was a nonsensical architectural feature for a railway station. However, at the time the railway industry had no defining architecture of its own; it was simply too new. As a new-fangled and distinctly scary technology, railway companies of the day were keen to stress the solidity and trustworthiness of their product, and the Euston Arch fitted the bill precisely, a reassuring solid presence anchoring the not-yet-fully-developed technology of the railways firmly to historical respectability and continuity. The London and Birmingham was a great success. 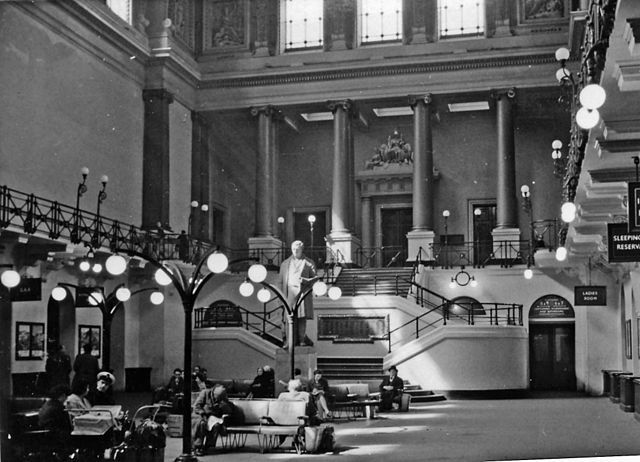 Before long, and in light of increasing passenger numbers, the London and Birmingham sought to develop Euston station, and commissioned from Hardwick a further statement of its ambition and prowess, in the form of a showpiece waiting room for passengers, and a boardroom for the company’s directors. 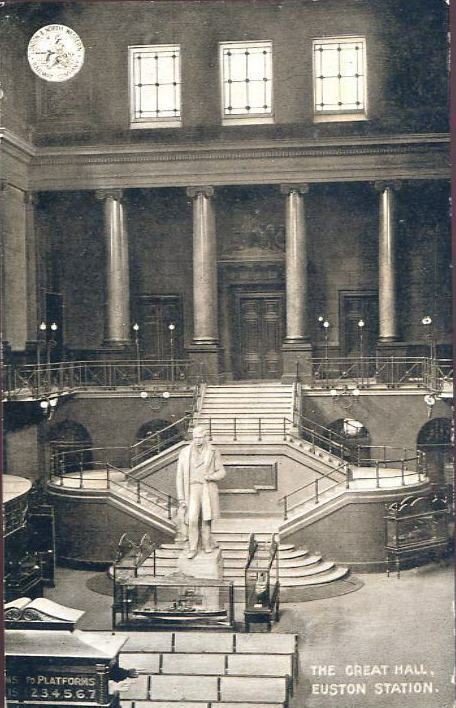 It was that waiting room, known as the Great Hall, which was the very best bit of the old Euston. The Arch was dramatic, imposing, and an important piece of railway history, but it wasn’t actually for anything. The Great Hall, however, was not only beautiful but was useful too. Hardwick, who had been trained by his father, gave the job of designing it to his son, Philip Charles Hardwick. What the latter came up with was something which looked unlike anything seen before or since on the British railway network, which is why its loss hurts so much. The Great Hall opened in 1849. Based on the proportions of a double cube (a pleasing architectural volume used in other buildings such as Inigo Jones’ Whitehall Banqueting House in London), the Great Hall had the largest ceiling span of any building in the world when it opened. Forty-two metres long and 19m wide, it was lined with 6m tall Ionic columns painted to resemble red granite, while plaster reliefs representing the London and Birmingham’s key destinations decorated the walls. The ceiling, as well as being large, was a lift from the basilica of St Paul’s outside Rome. It seeped into the consciousness of what railway architecture was supposed to be; grand, imposing and uplifting. Though it was never replicated in Britain, I’m firmly of the opinion that you can see it in stations like Grand Central Terminal in New York, where the staircases down to the floor of the express concourse evoke a very similar feel. 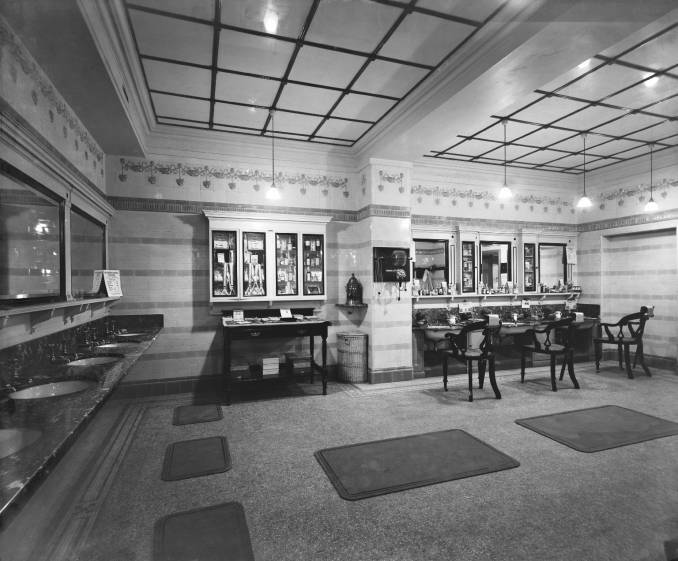 In general it set the template for impressive ticket halls at railway stations, so many of which have already featured in the pages of this blog. In fact, the Great Hall wins my vote every time for the greatest lost transport building in Britain. It was simply that good. There were other treasures to be found at the old Euston. The aforementioned boardroom was the epitome of comfortable Victorian big business (see a picture here). Meanwhile, at what other British railway station could you have found as opulent a hairdressing salon (or indeed any hairdressing salon at all) as the one at Euston? British Rail gets a lot of criticism, some of it deserved, for knocking down the old Euston station and its Arch. However, it certainly didn’t dream up the idea for doing so out of thin air. 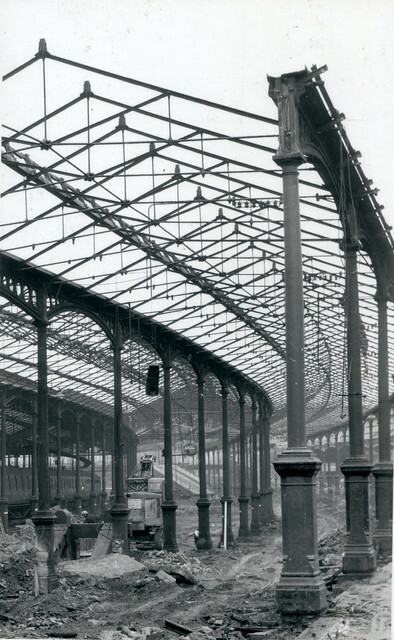 The station’s pre-war owners, the London, Midland & Scottish Railway, had wanted to demolish Euston and St Pancras, combining them into one vast American-style Union station, and in the 1930s a design was drawn up by architect Percy Thomas. It is criticised for being “monumental; but it was also disappointingly dull and lifeless” (Parissien, 2014: p111). I reckon it looks like an inter-war Modernist department store, which I’m not entirely sure is a bad thing, given that I rather like inter-war Modernist department stores (see below, and if you can’t see a picture of it you might be reading this as an email, in which case please head over to the web version of this article, here). The Second World War put a stop to the LMS’s plans, but the idea of rebuilding Euston was resurrected by British Rail in 1959, rather bizarrely only a few years after it comprehensively restored the Great Hall. At least under British Rail’s plans the idea of merging St Pancras and Euston was dropped, although that was hardly a reprieve for St Pancras, which would find itself in BR’s crosshairs only a few years later. 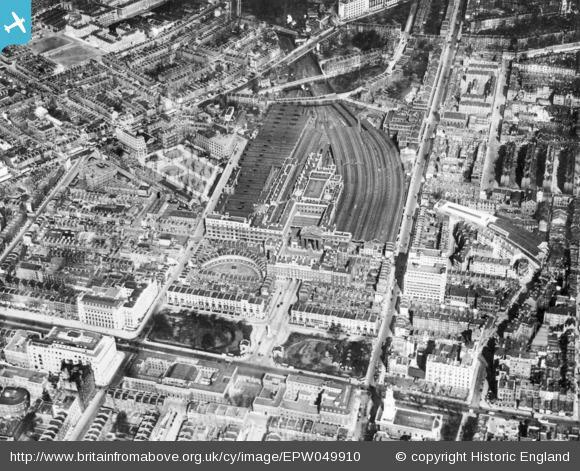 Meanwhile, everything at the old Euston would have to go in order to accommodate the new, rational, station which would serve a newly-electrified West Coast Main Line. John Betjeman, poet and architecture critic, who would later achieve heroic status for his efforts in the campaign to save St Pancras station, wanted to save the arch, but was prepared to let the rest of the station, Great Hall included, go. His position was mirrored by that of the Victorian Society, which seemed surprisingly relaxed about the impending demolition of the Great Hall, boardroom, hairdressing salon and other eye-candy at the station. What really did for the public perception of BR in regard to the Arch, was that having demolished it, the company refused to tell anyone what it had done with the remains. It took until the 1990s for architectural historian Dan Cruickshank to discover that some of the decorative outer stones had been used in a garden rockery, and the remainder dumped in the River Lea (see here). Cruickshank is now backing a plan to rebuild the Euston Arch (see the Euston Arch Trust website), which might or might not benefit from the fact that it seems likely that Euston will have to be rebuilt once again in the next decade so that it can function as the London terminus of the proposed north-south High Speed 2 line. 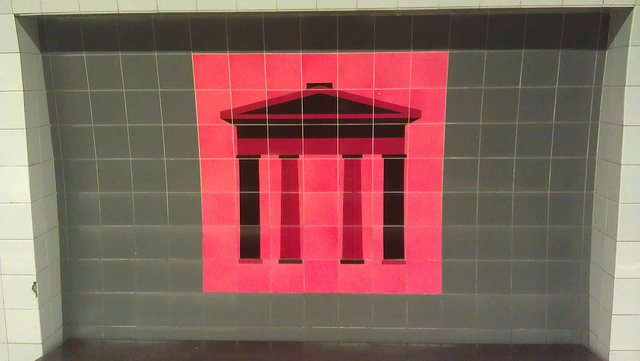 Meanwhile, the attention being focussed on the Euston Arch ensured that the loss of the staggeringly beautiful other parts of the station passed almost unnoticed. It’s only now that we’ve come to understand what we lost. I don’t know how the Great Hall could have been retained given that railway tracks and platforms now occupy the location where it once stood, but what a shame to lose a building like that. The 1968 version of Euston which we have today suffers in the estimation of many simply because it isn’t the old Euston. Some of it is not nearly as bad as its critics suggest. Calling the new Euston’s main concourse the Great Hall was perhaps a mis-step and only likely to cause offence, but it has the basic elements of what ought to be a cool and very classy Mad Men aesthetic. That it doesn’t is partly because it’s been wilfully mistreated over the years, and also because it’s simply too busy. It’s too full of bleary (on the way in) and weary (on the way out) commuters, loud business travellers, and confused tourists. And then there are the woeful ramps down onto the platforms, stomach churning lurches down to the dark and claustrophobic platforms, buried underneath a car park and parcels depot, and as bad as anything at the much criticised new New Street station in Birmingham, rebuilt at the same time. 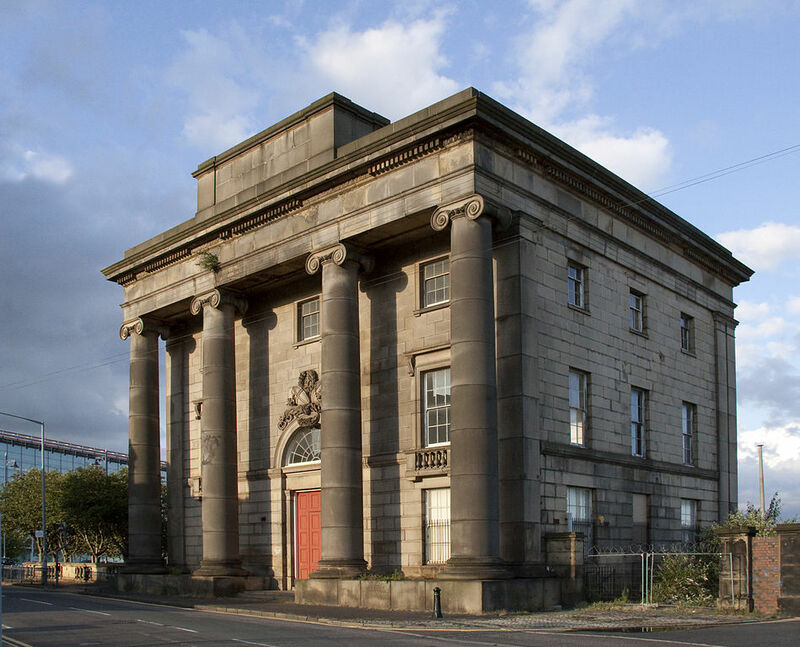 Hardwick’s (the senior Hardwick, that is) Curzon Street Ionic portico in Birmingham still stands, Grade I listed but largely unused, a monument to the world’s first railway company architect, though the rest of Curzon Street station has long since been demolished. It occasionally opens to host art exhibitions though images of the inside of the building (either in its prime or more recent) are frustratingly difficult to locate, and it’s difficult to know if it was anything like as grand as the Great Hall in Euston. There are some recent photos on flickr here, but it’s difficult to judge what the interiors were like when the building opened. Current plans for the High Speed 2 terminus in Birmingham foresee the re-use of the Curzon Street site, and it might be that the portico is refurbished and reused in some way. In that case, passengers will finally be able to access regularly this piece of important railway architecture. But whatever happens with the High Speed 2 redevelopment of Euston, they’ll never be able to stand in the Great Hall of the old station. When it comes to that lost beauty of the world of transport, as a wise person once said, you can dream, but you can never go back. So where i Liverpool or Manchester is this? You’re right, Liverpool and Manchester were first, and I was born in Liverpool, so I have every reason to be proud of Liverpool’s role in the development of the railway industry. That was why I very carefully wrote that the London and Birmingham was “the world’s first long distance inter-city railway”, rather than just the world’s first inter-city railway. What the substantial length of the London and Birmingham crucially proved was that the railways had the potential to link an entire country, not just two relatively closely spaced cities. Not to mention that then, as indeed now, things that happen in the north of England are often played down or overlooked by those in the capital. The London and Birmingham brought long distance inter-city train travel to London itself, which couldn’t be ignored. I hope to do something on the London & Manchester before too long, given the recent controversies over the Ordsall Chord and its impact on the eastern end of the original line. Thanks for providing a good read. I too am fascinated by the Great Hall at Euston. A great pity I never saw it. I find it frustrating how few colour pictures there are of the Great Hall. I have only found one. For me a colour photo adds immediacy. The mind’s eye can walk into a colour photos much more easily than a black and white…….so, I had a go at colourising the Great Hall photo on your blog. It has turned out pretty well – I used the colour scheme as best I could, mainly derived from the only colour photo I could find, but also with a bit of guesswork. I can’t seem to be able to attach it to this response box so please let me know if you’d like to see my the colourised version. Thanks, that sounds great. You can email me the image via the address on the contact page. Before you do, note that you’re modifying public domain/creative commons images so your colourised image is covered by the same licences which mean that others can potentially recirculate or reuse. Assuming you’re happy with this, I’ll attach it to your comment. Alongside the modern Euston station there is a huge what looks like rail shed. I have wondered for a long time what it is, and whether it could more usefully be utilised. I am a member of the Great Central Railway, a steam locomotive enthusiast, and think how awesome it would be to run regular steam trains into Euston. Perhaps this shed could be used for that? It might even reduce the tight squeeze for commuters like me on London Midland – I’d love to hear from anyone with information.